This post is the first in a series to identify Aladdin Company kit houses that were manufactured locally and shipped to sites within Mississippi. Thanks to Cindy Catanzaro and the Clarke Historical Library in Mt. Pleasant, Michigan we’ve had an opportunity to see the ledger for the Aladdin Company mail order home plant that was located in Hattiesburg. Aladdin likely shipped kit houses into Mississippi for nearly the entirety of their eighty-one year existence, but the Aladdin plant in Hattiesburg operated for less than three years between 1919 and 1921. One of the ledger orders was for a Winthrop model requested by a “J H Bassette” to be shipped to Newton, Mississippi. The Winthrop model was offered approximately between 1913 to 1923 by Aladdin, and the company even had a Winthrop model on Adeline Street in Hattiesburg that was available for prospective buyers to tour. Can you imagine this bungalow nestling among trees and shrubbery on your own lot? A few cobblestones are gathered from nearby fields and when blended with brown stained shingles, natural shrubbery and a setting of velvety green, the observer is fascinated. A bungalow should always be set close to the ground. When local conditions seem to make this impossible the same results can be secured by terracing close to the building. 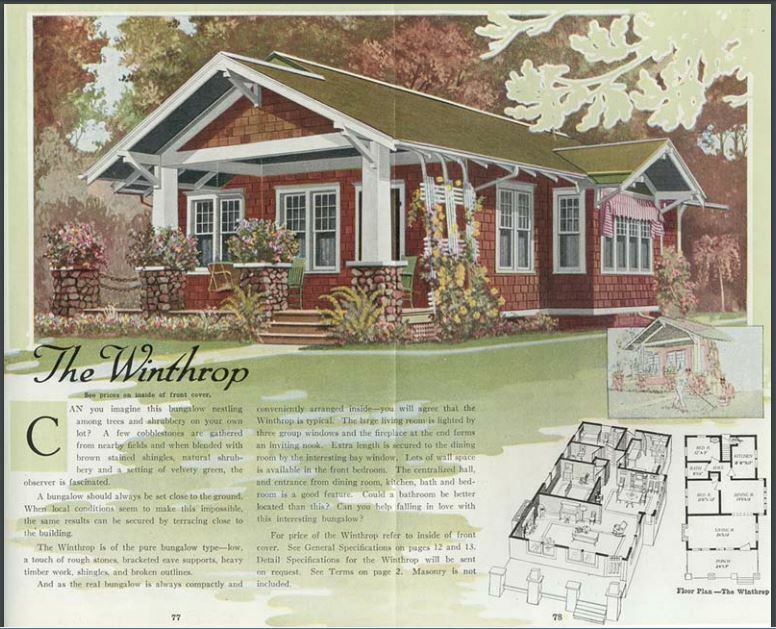 The Winthrop is of the pure bungalow type–low, a touch of rough stones, bracketed eave supports heavy timer work, shingles and broken outlines. And as the real bungalow is always compactly and conveniently arranged inside–you will agree that the Winthrop is typical. The large living room is lighted by three group windows and the fireplace at the end forms an inviting nook. Extra length is secured to the dining room by the interesting bay window. Lots of wall space is available in the front bedroom. The centralized hall, and entrance from dining room, kitchen, bath and bedroom is a good feature. Could a bathroom be better located than this? Can you help falling in love with this interesting bungalow? I don’t know that city directories were ever produced for small towns such as Newton, but federal census records can do in a pinch. In 1920 there is a James H. Bassett, a 57-year-old insurance agent, and along with his 27-year-old wife Minta, he is boarding at 237 Church Street. This at least gave me a place to start, so I used google street view to take a stroll along Church Street. Lo and behold I came across a house that looks like a Winthrop model. Mr. Bassett had a grown son, Felix, who was listed as a house carpenter in the very same federal census. J.H. Bassett died in 1928, and his wife was living with three boarders and two young daughters in the 1930 census, but that census only lists the location as Church Street and does not give a street address for the family. The 1940 census is even less helpful, identifying neither the street number or name for the Bassetts, but it does indicate that they were living in the same location in 1940 as they were in 1935. No definitive answer that this is the house from the ledger, but it is likely an Aladdin Winthrop model. 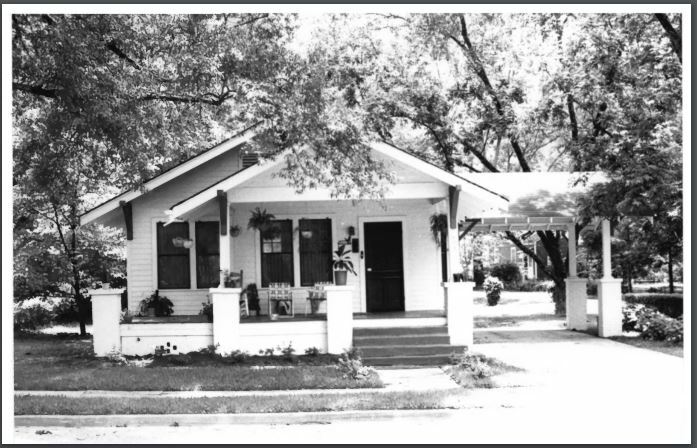 The earliest photo of the house I found was a July 1979 photo from the Newton West Church Street Historic District National Register nomination. The owner given in the nomination is named McGehee, so there is no clear lineage back to Bassett provided in the National Register District Nomination. The house has an added portico to the west, a feature not indicated on the Aladdin plans of the Winthrop, but this may have been the handiwork of Felix Bassett. The chimneys mentioned in the description may have been omitted at the time of construction, and since there are no cobblestones in Newton, a brick foundation and piers is a logical choice. There is also a historic addition on the rear of the house. What do you think? Could this be the house identified in the ledger as shipped from the Aladdin plant in Hattiesburg to Newton? ‹ Who Built the Lyceum? Looks pretty close to me, even down to the extension of the porch piers as a terrace out to the left side. Great detective work! 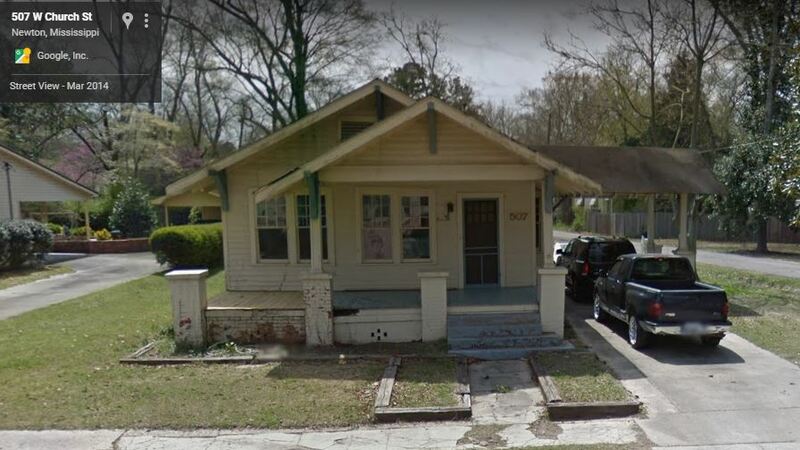 Is the model house in Hattiesburg on Adeline St. extant–love using that word! I live on that street in Parkhaven. I like that word, too. Over on 1120 West Pine Street is the last extant Gordon Von Tine kit house. The original front porch railing was of a concave picket fence design . It was in that general area that the Gordon von Tine plant was located. At one time, the company had a gallery of homes display on Broadway Drive. The homes were moved in the early 1950s. Interesting, I am familiar with the GVT house on West Pine but was unaware of the houses that once sat on broadway. Do you know where they were move to or were they moved as in demolished? Some of the GVT homes were moved intact by Hattiesburg native Lonnie Taylor’s father. Lonnie recalls of one move to West Fourth Street and another to Oak Grove. The West Fourth expansion took that home, he said. The other home at Oak Grove was jacked-up and placed upon a concrete block wall so as to make a basement. Then a brick veneer wall was constructed around the concrete wall and the GVT home. Not exactly “extant.” Lonnie relocated to Wyoming this past Spring. He was one of the few remaining “shirtsleeve” historians of Hattiesburg. I know of one other. I’ll see what he knows. Is porte co·chère too difficult to pronounce? Gleaned from a viewing of the newspaper archives today, there is a report in the 14JULY1931 edition of the Hattiesburg-American that a mile-long train–pulled by seven Mallet locomotives, loaded with 3,000,000 bd. ft. of California redwood lumber and billed as the Redwood Empire Special–arrived in Hattiesburg from Sacramento, California. There is also a report from the 23MARCH1934 edition that GVT donated a total of eight “Huts” to Camp Dantzler. Lumber was donated by the Newman and Tatum lumber companies and GVT milled the lumber and hauled it to the site. So there may be donated properties that do not appear in the sales records. hmm I’m not sure who has the factory records for Gordon-Van Tine. The Redwood Empire Special with 3,000,000 bd. ft. of California Redwood in route from Sacramento, California to Hattiesburg, Mississippi. Sometime along the way, I suspect that six more Mallet locomotive engines would have been required to move those 117 Redwood-loaded rail cars across the Big Divide. The Hattiesburg-American report indicated seven Mallet locomotives arriving at GVT. On further inspection, I can now see the other locomotive engines. Could the J.J. Bethea colonial in Hattiesburg–set to be demolished as the result of aquifer-contamination by Hercules Powder Company– be a Harris Bros. Ten Room Colonial The Magnolia? Harris Bros. maintained a branch office at Camp Shelby through the “Great War”(sic) until 1921. Not the Magnolia, for sure!